I forgot to post these ammunition carriers in my last post. 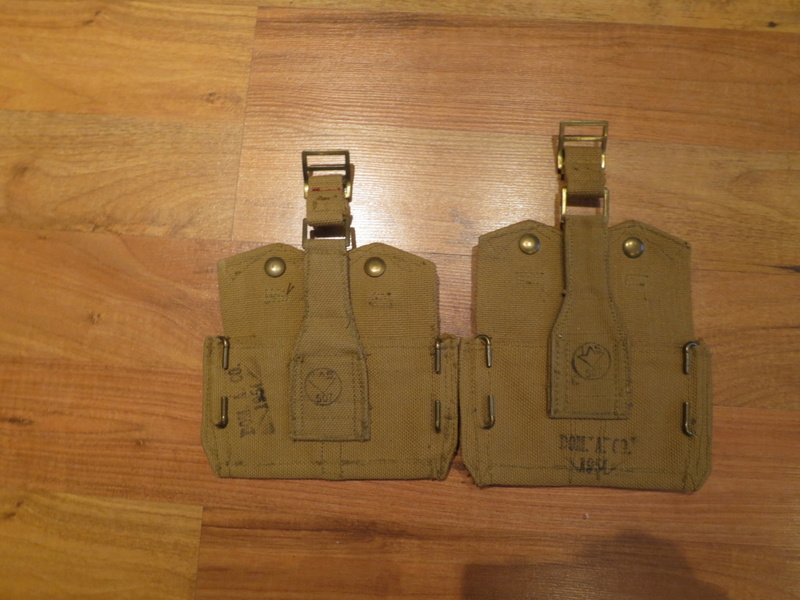 I am not sure if these are 51 Pattern ammunition carriers or postwar production 37 Pattern ammunition carriers. Manufacturer DOM A CO., stamped 1951. 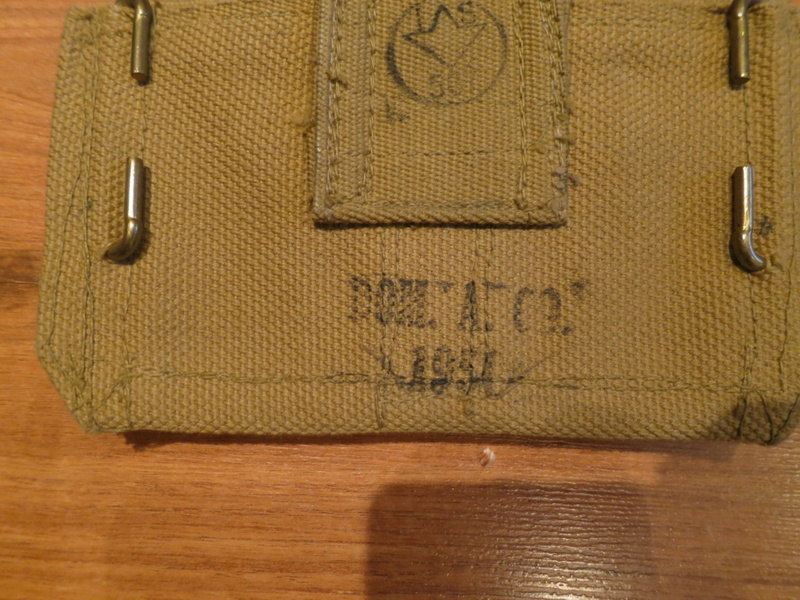 So, are they 51 Pattern or post war production 37 Pattern? 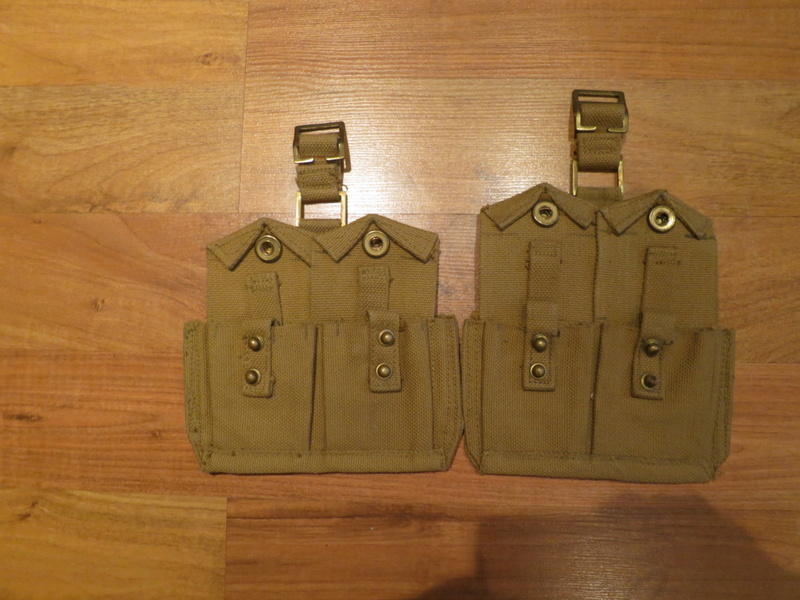 I am leaning to 37 Patten as 51 Pattern did not have brass hardware as these carrier do nor was it produced in khaki colour (as far as I know). A collector I know informed me that 37 Pattern was produced up to the 1980's, something else I didn't know. I was under the impression that 37 Pattern was not manufactured in Canada after the war , and the army disposed of most of their 37 Pattern equipments under the believe they had enough equipments left over for future use. This resulting in the shortage caused by the start of the Korean War. Post war production 37 pattern for sure. 51 pattern did not include this item in the set and all 51 pattern equipment was manufactured in the dark green color. Although not difficult pouches to find, they are rather uncommon with such a late date. I still wonder why these item were made. I have all my reference books packed for moving so I can't check my facts. Why not just produce these in 51 Pattern green even if these particular pouches were not in the 51 Pattern production? 1937 Pattern was still the issue web equipment when those Cartridge Carriers were manufactured in 1951 as 1951 Pattern Web was not introduced into service until 1954. Even then 1937 Pattern was used well into 1960. 1937 Pattern was manufactured in the early 1950s in Canada to make up for deficiencies in the stocks being held as Canada now had military commitments in Korea with the UN and Northern Germany with NATO. Thanks for the reply and the listed information Ed. Do you have any thoughts regarding the late variation of the 51 Pattern belt I posted. Also, the 64 Pattern webbing that was not treated with the NBC material.